I’m fascinated by how people travel and vacation in different ways. Picture your ideal vacation. Say you get a week off work and have a $1,500 budget. Where do you go? What do you do? Here’s what I’d do: I’d fly to a foreign land, find a remote town and settle in for the week at a cozy inn. I’d read and write and get drunk with the locals. I’d eat good food–lots of good food. I’d flirt with girls with cute accents. I’d take walks and sleep in. And if there’s something famous in the area, I’d check it out but not obsess over it. How do I know this? A few years ago I went to Wales because I was working on a novel about Frank Lloyd Wright. We drove all across Wales for three days and then spent three days walking all across London. It was a great trip. 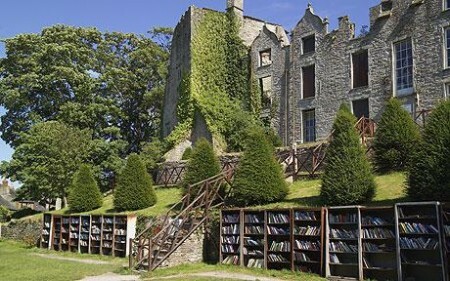 However, two days into the trip, we stopped at a town called Hay-on-Wye. It has the highest number of bookstores per capita of anywhere in the world–it’s a tiny town, and I think they have about 30 bookstores. We spent the night there, perused the bookstores (I bought a 150-year-old hollow book. Yes, be jealous), and then jetted off to see more of Wales. I wish we had stayed. I would have been perfectly happy if we had stayed. I understand that many people have very different ideal vacations. Some people want to run around and see everything. Their trip isn’t complete without 100 photos of them standing in front of churches and monuments and sculptures. Others want to sleep in hostels and meet tons of other travelers. And others want to party–they want to dance in Prague until the sunrise puts them to bed. These are all good things to know about someone you’re going to travel with. So…how do you travel? Does it match how your significant other likes to travel? This entry was posted on Friday, May 6th, 2011 at 12:45 am	and is filed under personal, travel and tagged with personal, travel. You can follow any responses to this entry through the RSS 2.0 feed. I’m the same way, Jamey. My wife and I have been to Italy together twice. The first time we spent a week in Rome (rented an apartment), and both times we spent a week hanging out with her parents, who have a townhouse in a tiny town about an hour outside of Bologna. The trips consisted of finding a favorite bar to have a morning cappuccino and then going back there each morning to become familiar faces. Walking around a lot, but aimlessly. Often going to a grocery store and picking up supplies to make/eat a simple lunch at home and take a nap. Wandering around until we found a spot that looked nice for dinner. Going up to the roof of our apartment at night with a glass of wine or champagne and taking in the sounds and night sky. Essentially, just living in the city instead of checking off items on a to-do list. I have enough to-do lists in my normal life; I don’t want them on vacation. Nicholas–That sounds exactly how I like to travel. It is nice to be able to take a break from the to-do list and just pretend to live in a foreign country for a week. In an ideal world, I’d be a “settle in” type of person. I enjoy getting to know what an area is really like. However, I just don’t have enough time to travel to see all of the things I’d like to see, so I feel like I’ve become a highlights person. I do want to see it all–I’d love to have time to settle in AND see it all, but I usually have to settle for fast-paced highlights. I love discovered the best that an area has to offer outside of its main attractions (e.g., skip the empire state building, find the best fondue). This is usually reflected in the places I visit. For instance, I went to the Grand Canyon a few years ago, and I vastly preferred the North Rim (less crowded, a bit colder, views might not generally be considered be quite as good) to the South Rim (tour buses arriving regularly). I usually try to pick places to vacation/explore that are a little off the beaten path. My wife is pretty well aligned to this, although she likes to slow down every now and then and spend 2 nights in the same spot, which I can get on board with. So if you went on a vacation and just relaxed for a week, would you feel like you had wasted your time? I’m not sure. Laura and I have been talking about going to an all-inclusive place and basically not leaving the beach. I’d like to give it a try. It’s hard to swallow the thought that I could see the surrounding areas but that I’d intentionally let the opportunity slip by. Interesting. What’s particularly interesting is that what you perceive as opportunities to see new things slipping by, others may view as their relaxation time slipping by. Now, I agree that one could relax pretty much anywhere. That’s why I like putting foreign twists on relaxing–relax in a way that I can’t here in St. Louis. Great post. I’ve decided my favorite way to travel is to spend the first few days totally relaxing – beach, reading, walking around, taking in the world around me, eating deliciousness, actually taking an hour to enjoy a cup of coffee, etc. After that I want to do something. I’m active, so I need to keep up with that. Whether it’s renting a bike and exploring or zip lining through the rain forest, I need to get my adrenaline up. Either way though, I want to be around locals, stay in boutique hotels and get the inside scoop about that fabulous restaurant tourists don’t know about. Penelope–That sounds like a good balance between relaxing and adventuring. I’m glad you’ve found what works for you. Well, it’s been a while since I have been on the message boards so I’ll chime in. I get bored easily; I can’t sit on a beach and read a book for days on end. I need action, but I don’t particularly love sight seeing. So…ideal vacation? Steggy, I think you know where I’m headed. Vegas. Late nights, great meals, sports gambling, booze. Either with the boys or with the gf, either way it’s a whole lotta fun. I just love the lights and the action; there’s energy in the air in Vegas and that’s what gets me off. A close second would be a sports based trip – like a trip to my hometown to catch the Falcons, Braves and Hawks all lose in one weekend. Eric–Good to hear from you! Both of those options sound very much like you. I can see how some people want those heart-pounding, nonstop weekends–I simply can’t keep up with those people! You pose an interesting question. It probably is very important whoever you’re traveling with also has the same wants and routines out of the trip you’re going on together. I’ve tried traveling with 3 girls who only wanted to hit the clubs rather than settling in, which, I was perfectly happy settling in playing cards and getting to know people. I prefer to get to know people where I can hear them rather than dance with them first. On the flip side, I’ve traveled with some who want to constantly be on the go when all I wanted to do was sit in the sun for an hour and relax before we had to be off somewhere else. Like you, there are some places during traveling, that if for some reason the tire on the car burst and I was stuck in a village with some cool locals, with some fun accents…just leave me there. Especially if there are good books…and good stories being told by the locals at the pub. There is no need to be on the go just so you can get your picture in front of a bunch of monuments that potentially won’t matter in a 1000 years. What matters is the experience of temporarily losing yourself in another culture. Then there are other times where I wanted to see something of great significance (for me it was Abbey Road Studios) and nobody else really wanted to see it. Georgia–It sounds like you’re pretty flexible when traveling. One piece of advice I’ve been given is if you’re traveling with people and you have something (say, Abbey Road Studios) that you really want to see that no one else cares about it, it’s okay for you to go there while the others do something else. That way people don’t feel dragged along. Oops, the Abbey Road comment sounded bad out of context! They actually did do something else and didn’t mind doing the other thing instead of coming to the studios. There is a whole side story that accompanies the Abbey Road Studios experience. So, luckily they didn’t feel dragged along and they got to see all the Royal related stuff they wanted to. Yeah I don’t mind if people do other things while traveling…BUT its always nice to have someone experience something with you. For instance, I would never want to go to the Sistene Chapel by myself. That is something, for some reason, I’ve had in my head that you share with someone.